This trip provides the experience of a lifetime for avid kayakers, wildlife lovers, whale watchers and outdoor enthusiasts. As you encounter the magnificent gray whale and the wonders of the Sea of Cortez, you’ll combine the best of both coasts of Baja. Half of your trip will explore the beautiful Island of Espiritu Santo in the Sea of Cortez, exploring beautiful white sand beaches, canyons adorned with hanging fig trees and snorkeling among friendly sea lions, tropical fish and an opportunity to snorkel with whale sharks (weather permitting). The other half of your trip offers close encounters with the pacific gray whales in Magdalena Bay. The gray whales have migrated from their feeding grounds in the north to court, breed, give birth and simply frolic in the waters of the protected bays along Baja’s Pacific coastline. Daily excursions into the bay in motorized skiffs, skillfully and sensitively operated by local boatmen, provide close up viewing of the magnificent and friendly gray whale. Other activities may include exploring the dunes and coast in search of whale bones, bird watching and kayaking in the mangrove estuaries, playing beach volleyball or enjoying a good book in the warm Baja sun. Please be advised that the Espiritu Santo Island and the Magdalena Bay portions of your trip may be reversed. Enjoy an early breakfast and orientation with our guides at the hotel’s cafe. Any rental items you’ve requested can be collected and paid for this morning. We then transfer by boat to the island of Espiritu Santo (approximately 2 hours). Lunch will be served upon arrival at camp. After lunch we will go through a camp and kayak orientation, then depart for a short paddle, snorkel or swim. *We try to include an opportunity to snorkel with whale sharks – either the morning we travel to the island or the morning we return, depending on the weather, calmness of the sea and the presence of the whale sharks. We’ll spend the days kayaking, snorkeling, hiking, fishing and relaxing along the shores of the enchanted island of Espiritu Santo. Guided kayak excursions from 1 – 4 hours are offered daily along the coast and to outlying islands. Camp is located in a large protected bay, allowing guests additional kayaking time to explore the sheltered bay. Other guided activities from camp include skiff excursions to nearby snorkeling “hot spots” including a sea lion rookery where we join these graceful creatures, swimming alongside them while enjoying their playful and curious nature first hand. Hiking into canyons draped with fig trees and fishing for sea bass and red snapper are other side attractions. After a casual morning and breakfast on the island, we’ll return by skiff to La Paz where we’ll indulge in a hot shower and lunch. On the way, we may have the opportunity to snorkel with whale sharks if not previously done. The remainder of the day is free to explore town. The guides and hotel staff are able to offer suggestions for destinations and restaurants for dinner. After an early breakfast at the hotel, we’ll transfer by van to the Pacific side of the Baja Peninsula (approximately 4 hours). Upon arrival at the embarcadero in Lopez Mateos, we’ll enjoy lunch before boarding the boats to go to our camp. En route, we whale watch for about 2 hours, arriving at camp later this afternoon. Motorized skiffs take us into the bay to view the magnificent gray whales. Two hours or more per day may be spent observing whales (whale watching by kayak is prohibited). Other activities include bird watching by skiff, sea kayaking in mangrove estuaries and hiking the coast and dunes of the barrier island. Each evening our knowledgeable naturalists present slide shows on gray whale natural history, behavior, and birds of the area. After breakfast we enjoy another opportunity to view the gray whales up-close and personal. We return to our base camp for lunch before our transfer back to La Paz. We typically arrive to La Paz around 5:00 PM. This evening is free to shower and relax or shop and wander through downtown. Often folks enjoy getting together with other travelers from the trip for dinner this evening at a restaurant in town. You should make arrangements to arrive in La Paz, Mexico on or before day 1 of your trip. The evening of day 1 is free to explore La Paz on your own and dine at one of its many fine restaurants. Our group will meet the following day for breakfast at our hotel. Final information with details regarding your hotel and a voucher for your taxi from the airport or the malecon (town center) will be sent by mail a few weeks before your trip. There are no direct flights from North America to La Paz (LAP). One option is to fly to San Jose del Cabo (SJD) and take a 3 hour shuttle to La Paz. 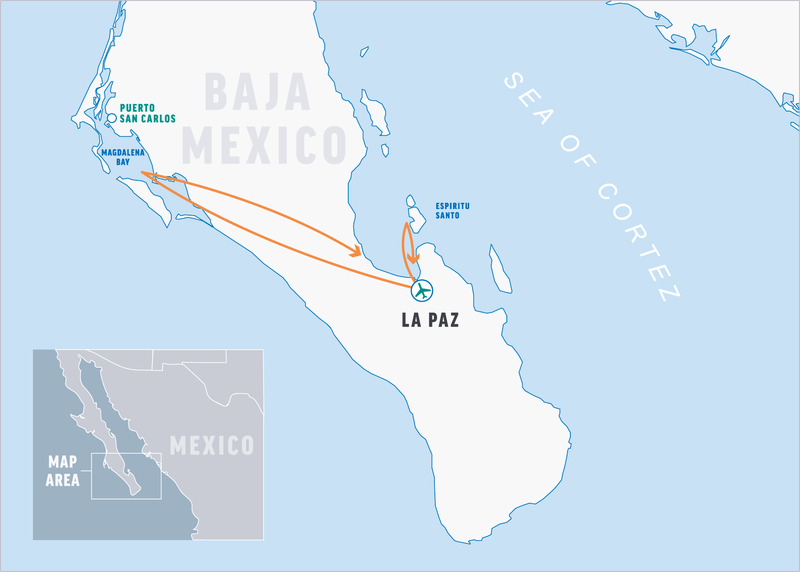 The other option is to connect into La Paz via Mexico City (MEX). Numerous airlines fly direct between North American cities and the airport in Cabo (Cabo is also referred to as Cabo San Lucas, Los Cabos and San Jose del Cabo where the airport is actually located). Airlines include Alaska, American, Continental, Frontier, Delta, Virgin America, WestJet, United and US Air. Airlines offering flights from Mexico City to La Paz include Aeromexico, Volaris and Interjet. Shared shuttle service: Ecobaja Tours is an inexpensive, reliable and efficient shuttle service. They operate several daily shuttles between the Cabo airport and the La Paz malecon, a short cab ride to the hotel. The drive takes approximately 3 hours. You will overnight in La Paz on the night of day 8. You may depart anytime on day 9. If you’re flying out of San Jose del Cabo, an afternoon departure will allow time to get there. This trip includes accommodation for the nights of itinerary day 1 through itinerary day 8. If you plan to arrive early or stay late, OARS can assist in booking pre- or post-trip accommodation at the hotel we use in La Paz. Visas are not required for U.S. citizens to enter Mexico. For non-U.S. citizens, please check with the consulate. Your airline will give you a tourist card to complete while on your flight. Be sure that you have signed both copies of this form. Please have this document and your passport available for the customs officer. Keep your copy of this form in a safe place; you will need it to exit Mexico. While at Magdalena Bay, a barrier island on the Pacific coast of the Baja Peninsula, we camp on the lee side. Nestled in sand dunes, our camp faces the bay and often provides a great view of whales and dolphins as they swim by. A small mangrove estuary is a short paddle from camp and provides a peaceful kayaking experience while you observe its abundant bird life. The Pacific Ocean is a 20-minute walk across the majestic windswept sand dunes and provides the lovely sound of waves caressing the beach 24 hours a day. The kitchen and dining area is comprised of large MASH-style wall tents that offer protection from the sun and the wind. The tents are furnished with tables and chairs for eating or relaxing, and feature solar-powered lighting in the evenings. Our guides give presentations here on the local ecology and the biology of the gray whale. Some chaise lounges offer the opportunity for sun bathing on the beach. Solar sun showers are available for showering in private shower stalls. Large (10’x12′) walk-in canvas tents are provided for sleeping accommodations, each complete with two cots, sleeping pads and tables. These tents are provided for double occupancy, while smaller backpacking-style tents may be used for singles. The toilets are self-contained porta-potties that flush with water. They are set up in private stalls behind camp and emptied daily. On Espiritu Santo Island, we camp on a white sand beach sandwiched between a shallow, protected bay and the towering cactus of the Southern Sonoran Desert. Large kitchen and dining tents are provided complete with dining tables and chairs for protection from the sun and wind and feature solar-powered lighting in the evenings. A large tarp provides additional shade on the beach. Walk-in canvas tents are provided for sleeping accommodations, each complete with two cots, sleeping pads and tables. These tents are provided for double occupancy, while smaller backpacking-style tents may be used for singles. A private solar shower area is set up for rinsing off salt after you bathe in the sea with biodegradable soap. The toilets are self-contained porta-potties that flush with water. They are set up in private stalls behind camp and emptied daily. We carry sufficient drinking water along with us to provide for your needs throughout the trip. Water is accessible in camp and before excursions for filling personal water bottles. Fresh drinking water is also available at your hotel. We recommend when you are out and about on your own that you drink bottled water. You will have the opportunity to purchase your own favorite soft drinks or alcohol prior to leaving for Magdalena Bay and Espiritu Santo Island. Our crew will ice your daily choice of beverage in the drink cooler each day during the trip. Sunset each evening is celebrated with happy hour, in which a cocktail is provided. You might have ice-cold, freshly squeezed lime margaritas made with 100% agave tequila or fresh pineapple and coconut laden piña coladas. Our fleet of kayaks on each trip is comprised primarily of double kayaks and we bring at least one single kayak to be used on a shared basis. Most are made by SEDA products of fiberglass construction and all are equipped with rudders. We do have a few rotomolded (plastic) boats in our fleet for variety in seat construction as some of our guests find the plastic boat seats more comfortable. Based upon your experience, size and group composition your guide will help determine what kayak you will paddle, double or single, fiberglass or plastic. We encourage the group to rotate kayaks so everyone has a chance to paddle to their desire. We offer exclusive use of a single kayak on most trips for a fee of $50 per kayak. You must be fit and experienced in kayaking and screened in advance by our office. The option of exclusive use of a single kayak is limited to the Espiritu Santo Island portion only. We offer fishing as a side activity on the Sea of Cortez portion, not on the Magdalena Bay whale watching excursion. Fishing on our kayak trips is done by trolling behind a motorized skiff (two rods at a time) from one to two hours before breakfast on certain mornings or from your kayak. If you want to fish, please come prepared with your own lures. We can supply a rod & reel, but you may prefer your own. Medium to small minnow-type, sinking lures are suggested such as a Rebel jointed Fastrac or mid-size Rapala Magnums (4.5 to 5 inches or 9-12cm in length). Suggested colors include: blue/silver, black/silver, black/gold, green mackerel/gold or blue mackerel/silver. At Magdalena Bay, solar sun showers are available for showering in private shower stalls. On Espiritu Santo Island, a private solar shower area is set up for rinsing off salt after you bathe in the sea with biodegradable soap. Dr. Bonner’s does not lather well in salt water; Campsuds, Joy or Dawn work well and are biodegradable. Mexico’s electrical system is the same as in the U.S. and uses the same type of plugs. You will have regular access to electricity when you are in La Paz. While at our camps, you’ll be able to recharge your camera and other batteries during limited times we are operating a generator. A small solar charger is a good option, too, if you think you’ll need to recharge your batteries on a more regular basis. In addition to your regular camera case, we recommend using extra protection such as zip-lock plastic bags, a waterproof camera case or a small day dry bag in the kayak, with padding. Water and dust can be a problem—so clean your camera every night with tissue, a brush and lens paper. We strongly recommend you take out a rider on your homeowner’s policy to cover your camera—especially if it’s fine equipment. Make sure to bring additional memory cards, batteries and any other extras you will need. Disposable waterproof and panorama cameras are also a fun option. Although we do not require any immunizations to participate, it is important that you be up-to-date on several standard immunizations and that you check with your physician prior to departure. The CDC is a good resource for recommendations pertaining to international travel immunizations. The country of Mexico, including Baja, has a high incidence of Hepatitis A, a contagious liver disease. While we take all precautionary steps to prevent the spread of Hepatitis A at our hotel and on our trips, for complete protection we recommend our clients get vaccinated for Hepatitis A. Even if you aren’t anticipating your menstrual period, come prepared for it. You can use sandwich-sized Ziploc baggies during the day to store feminine products while you are on the water or hiking, and you can then discretely dispose of the baggies when you reach camp. When possible, we recommend o.b.® tampons, which are 1/3 the size of regular tampons, tuck discreetly into pockets and have less paper wrapping. If you use pads, be sure to bring extras. Many women suggest bringing a small supply of baby wipes. We provide some feminine products on most trips for emergencies. The weather during the whale watching season (late January through early March) tends to be cool with a chance of wind and some rain. Water temperatures are in the mid 60’s °F and daytime air temps range from the 60’s to 80’s °F. The weather at Magdalena Bay on the Pacific coast can be windy and chilly, although calm sunny days are common, while conditions at Espiritu Santo Island, on the Sea of Cortez, are typically calmer. You can bring your own sleeping bag or you can rent one from us. A cot with pad & pillow is provided for walk-in tents, a pad is provided for the backpacking-style single tents. Items you do not want to bring to Espiritu Santo Island or to Magdalena Bay may be left at the hotel in La Paz.